It was certainly autumn that walked down the runway to the live music heard in the background. It was a gorgeous fishnet stocking set with half boots, a breezy country blouse and a sleeveless fringed vest thrown over for maximum effect, while the legs peeked out nicely from underneath a high waist mini skirt. It was Rebecca Minkoff at her best, showing off the first of the 34 pieces that would grace the catwalk over the next 10 minutes. The lady behind the Rebecca Minkoff fall/winter 2015-2016 collection that captivated attendees but a few hours ago is an industry leader in casual luxury handbags, accessories and apparel. The subtly edgy designs have gained her much in terms of fame, making her one American fashion designer one should not try to compete against. She’s everywhere in the news of late, what with her setting trends and bringing new products to the market that women cannot help but adore. Back in 2001, all she had was a 5-piece apparel line that she decided to launch and it was a mere 8 years later in 2009 that she was honoured as a New York Moves power Women for her skills as an entrepreneur and her success in the fashion industry. There is a reason she’s a favorite for Lauren Conrad, Keira Knightley, Ashley Greene and Reese Witherspoon. 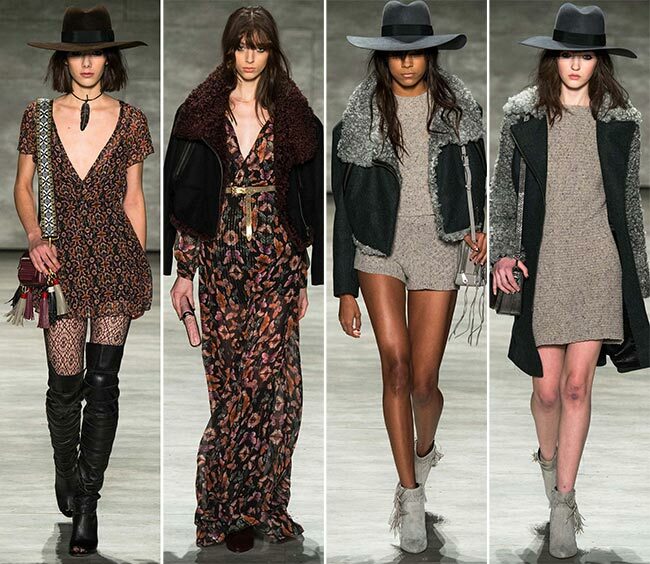 The Rebecca Minkoff fall/winter 2015-2016 collection was inspirational to say the least. 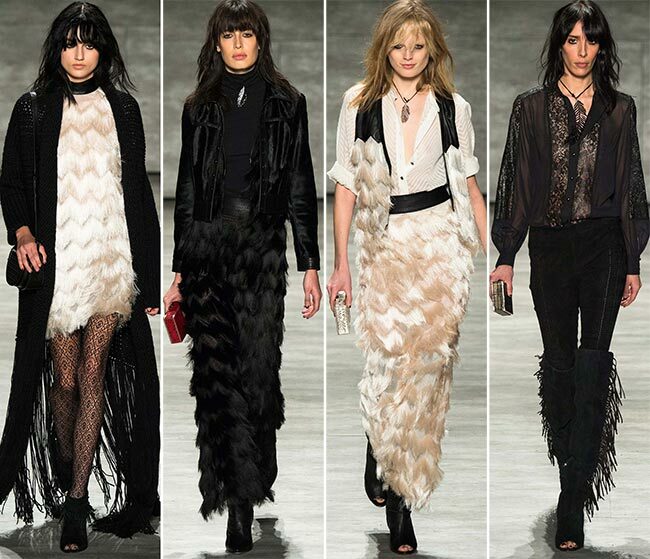 Meant for the fashion-forward female in this modern world, it introduced lots of legs to the 1970s homage that is all the rage in all four seasons of 2015, especially the spring/summer collections. There’s something very Wild Wild West about the whole thing, from the fringed boots to the brimmed cowboy hats, the lacy shirts and the dress effect. There are 34 different outfits that were paraded on the runway, each more dazzling than the last. It appears that the inspiration behind the line was Patti Smith’s book Just Kids, which has brought a post-hippie milieu and bohemian treasures to the pieces. 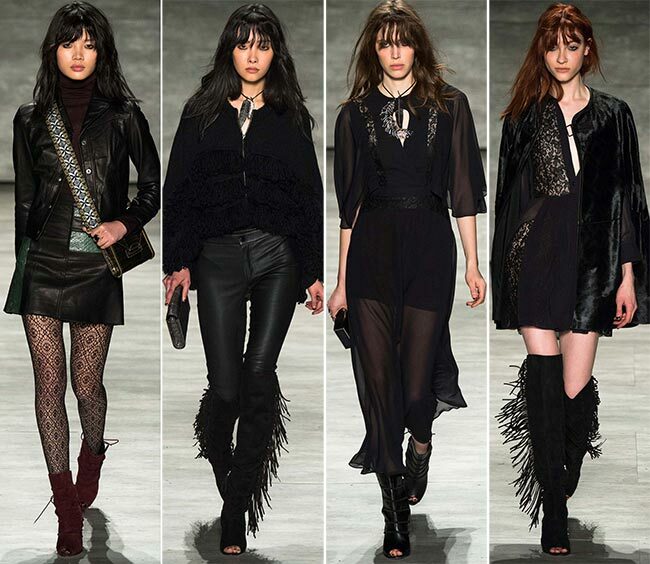 That includes the boho blouse, the tousled tresses, the leather pants and fringed vests. Embroidered guitar straps hold up the purses while freshly minted feather pendants make their own mark on the line. Minkoff’s customers look for the cute dress at the affordable price and on this she delivers perfectly. After all, who wouldn’t want a head to toe sweater dress? 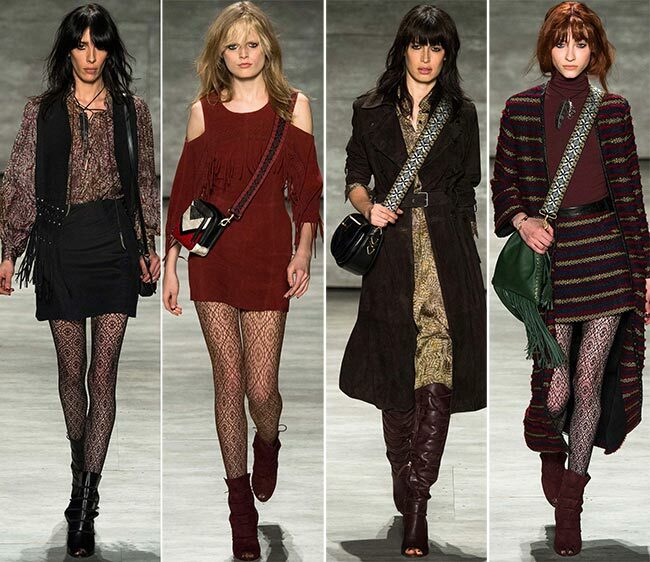 The hems generally hinge on the mini point, whether they are in red leather coming to mid-thigh, convoluted prints barely brushing the tops of the legs, warm black and grey designs that make mini look so good (and have matching coats to boot), as well as blue dresses that huge the body and have black fringe appear around the chest and on the boots, the legs clad in patterned fishnet stockings. The shoes across the line include lacing and fringe, from shiny leather half boots to red peep-toe designs, knee-length boots with open toes, and tasselled numbers in over the knee and ankle boot styles. What strikes us odd is the open toe. It may be trending with this collection, but for the OCD individual, it will simply never make sense. The rest of the outfits are perfection though and worth investing in. Those lacy boho blouses look great with any combination of layering it appears!